In recent months the Ukrainian people have increasingly demonstrated against their government over the repression of basic rights, rampant corruption and the economic direction of the country. Recently the clashes between riot police and protesters turned fatal when at least three were killed in the capital of Kiev, the primary locus of the conflict. The protests initially erupted on November 21st of last year when the government rejected key bills for a trade agreement with the EU in a shocking surprise and they have come to be labelled as the EuroMaidan movement. It is important to note that the controversy of moving towards greater European integration or returning to the Russian sphere of influence is secondary to the frustration and anger at the current administration of Victor Yanukovych and direction of the country as a whole. The quick implementation of harsher anti-demonstration laws have only added fuel to the fire, escalating the stakes between the increasingly detested government and protesters. It is apparent that the Ukrainian government cannot subdue the popular opposition with force alone, and if they refuse to make real concessions the conflict is likely to escalate further. In response to the heightened tensions, Yanukovych has promised to review the anti-protesting laws and reshuffle elements of his government. Token concessions will not likely sway his critics, however, as they are demanding an end to the power structure that has been deepening its control over the political and economic affairs of the country since Yanukovych took office in 2010. Further provisions allow for broad interpretation and implementation of censorship on the internet and ‘extremist activities’ in general. These measures have been overwhelmingly criticized both domestically and internationally; some have described the laws as moves towards dictatorship in the country. The controversy of the ‘hijacking’ of the opposition by extremist factions is reminiscent of the rhetoric used by Bashar al-Assad to decry and generalize the Syrian opposition as foreign terrorist elements. Svoboda is the most significant far-right party actively participating in the protests and there are smaller fringe groups that are attempting to push more radical agendas against the state. It would be naive to paint the opposition as free of extremist actors but it is clear that they are a minority. The majority of Ukrainians are not extremists bent on dismantling the state but rather wish for an end to a government not representative of the people that they see as creeping away from democracy. Although the contexts and scale are completely different, similar to in Syria the opposition needs to be cognizant of itself presenting a representative voice in pursuing their demands, else they will face internal conflict and have a tougher time presenting themselves as legitimate. Extremist elements who promote and carry out unprovoked violence against the police need to be isolated and disavowed from the majority opposition. The goal of the opposition should not be to influence change in the government structure via violent force, but rather mass demonstration and civil disobedience to the unjust laws that limit basic freedoms. Yanukovych and the security forces should realize the more brutal they act, the less credibility they will have to the rest of the world and the further the situation is likely to devolve. Political changes are imperative, and in order to reach a settlement the government must be willing to give up more power than it is currently comfortable with. Yanukovych should make it clear he is willing to make significant reforms to the power structure he has been building and the opposition should support a negotiated solution and take measures to prevent escalating the bloodshed which can be done without abandoning their cause or diminishing their impact. 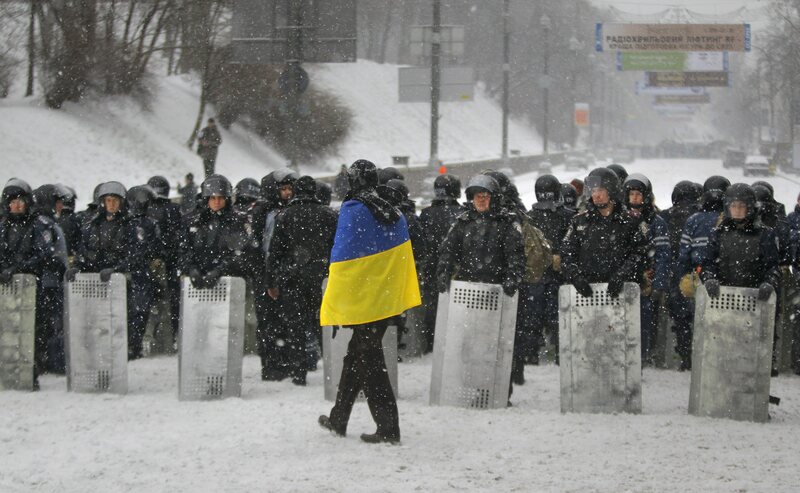 The Ukrainian people are demanding reform and they are not going to back down easily. If they can brave the subzero temperatures for days on end to make a statement, then perhaps their government should listen.